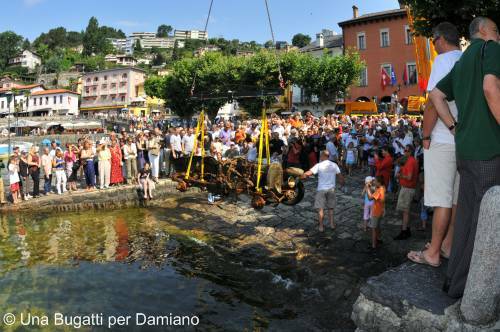 Ascona, 12th of July 2009: 10.30 a.m. punctual as a Swiss clock, the famous Bugatti Brescia, that has sunken in the lake more than 70 years ago in front of the gulf of Ascona, leaves for ever the dark water of Lago Maggiore. More than 2000 people gathered around the shore to witness this historical event. Everybody wants to see and take pictures of what will be removed from the lake. A thunderous applause between screams of joy and some tears of emotion welcomed what remains of the historical vehicle. A legend for the inhabitants of Ascona becomes a reality. In just a few hours with the complicity of the Swiss Italian media, the news circulates on the web and we were submerged by an avalanche of requests of information from all over. Not everybody knows that the story of this fascinating recovery started many months before. Everything started when a group of friends captained by Jens Boerlin whom, not only knows very well the Tamagni family, but also shares the passion for underwater sports. The question was: how could they pay homage to this family that had to deal with the premature and absurd loss of their son, that only just over 20, was cowardly attacked and beaten by three young boys at the Carnival of Locarno so heavily that he died from the injuries, which he had suffered? Primarily to help in their intent, trough the Trust created in the name of Damiano Tamagni, to make all the possible that episode’s alike will never be repeated. It needed a unique action with a big significance. The thought jumped spontaneously to one of the most famous legends of the history of Ascona: the Bugatti wreck. With the passing of the years the tale of this unusual sinking multiplied between the inhabitants of the little town, increasing the curiosity and the interest around this happening. Nobody until then has been able to make clarity on what happened and the mystery grew in the years. One thing was for sure: in the deep water in front of the gulf of Ascona there was an old-timer car. Mr. Ugo Pilon, from Ascona’s diving and rescue center discovered it on August 18th 1967 after he made several search dives. He found at 52 meters a wreak that reminded him of the shape of a car that could have been a Bugatti. The news of the finding quickly spread around the divers all around the Swiss side of Lago Maggiore that took the habit to dive there to go and see it with regularity. The many ropes attached at the vehicle also showed that some attempts had been made before to recuperate it. During this time some divers got already out two wheels. Was it really a Bugatti? This is the question that Boerlin Lavori Subaquei SA together with Centro Sport Subacquei Salvataggio Ascona had prefixed to uncover as they said in November 2008 in during the press conference held in Ascona to announce the official start of the operation that they called: “Una Bugatti per Damiano”. Write from the start the weather didn’t show itself from the best side. That day the heavy snowfall brought the Ticino out of control. And this as we witnessed afterwards was only the beginning. More than thirty volunteers worked with passion for the rescue. Because of the complexity of this operation it needed a floating operation station inclusive ROV etc. The time employed was of nine month (and not three month as anticipated). During the operation some unpleasant unforeseen events occurred. First and the more severe one, in the night of December 26th 2008 the floating work platform was hit by a very heavy storm. The platform sunk and stopped four meters four meters beside the car. On top of this we had to deal with heavy snowfalls, prickly cold weather and poor visibility underwater, all factors that didn’t demoralize the people involved to dive and spend hours out on the boat in the cold winter day’s. Nothing has been left in hazard during all the operation: considered the depth the divers had to work (52 meters), beyond all the needful authorizations released by the competent authorities, a carful studied security scheme has been applied. Only divers with the necessary experience and brevet, equipped with the suitable kit for this type of activity carried out the underwater work. Now after many efforts and a lot of patience the dream has come through. Sunday the 12th of July 2009 the number of Bugatti’s in Switzerland is increased by one! Thanks of the underwater shots and the numerous photos taken during the whole operation it has been possible to affirm that the Bugatti in the gulf of Ascona was not only a legend. The “guru” of Bugatti in Switzerland, Mr. Hans Matti, carefully examined the technical characteristics of the car immediately after it came out of the water and confirmed that with any doubt this is a Bugatti Brescia chassis type 22. Thanks of the number of the car 2461 we where quickly able to find out that it was first registered in Nancy, France on 11th of April 1925. The car is now stored in a suitably equipped place and has undergone adequate treatments to prevent further deterioration. What will happen now with the Bugatti Brescia 2461? When and how will it be sold? To be able to answer all this questions we got the opportunity thanks to the precious help of Bugatti Club Switzerland that gave us hospitality on their web site. So please don’t hesitate to visit bugatticlub.ch once in a while to get updated and to find all the latest news. The group of friends that conceived and worked for the project “Una Bugatti per Damiano” is composed by: Jens Boerlin, Francesca Lappe, Flavio Luzzi, Stefano Mattei, Federica Mauri, Nicola Sussigan, Pasqualino Trotta and they take this occasion to thank everybody, in this long period gave their gratuitous help and time and make it possible to have this dream to become reality.